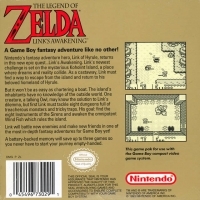 Box Text: A Game Boy fantasy adventure like no other! Nintendo's fantasy adventure hero, Link of Hyrule, returns in this new epic quest...Link's Awakening. Link's newest challenge is set on the mysterious Koholint Island, a place where dreams and reality collide. As a castaway, Link must find a way to escape from the island and return to his beloved homeland of Hyrule. But it won't be as easy as chartering a boat. The island's inhabitants have no knowledge of the outside world. One creature, a talking Owl, may know the solution to Link's dilemma, but first Link must tackle eight dungeons full of treacherous monsters and tricky traps. His goal: find the eight Instruments of the Sirens and awaken the omnipotent Wind Fish which rules the island. 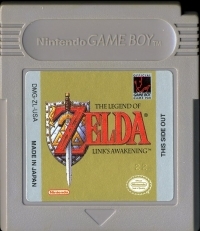 Link will battle new enemies and make new friends in one of the most in-depth fantasy adventures for Game Boy yet! A battery-backed memory will save up to three games so you never have to start your journey empty-handed. 07-19-2017 pzeke Box Text A Game Boy fantasy adventure like no other! Nintendo's fantasy adventure hero, Link of Hyrule, returns in this new epic quest...Link's Awakening. Link's newest challenge is set on the mysterious Koholint Island, a place where dreams and reality collide. As a castaway, Link must find a way to escape from the island and return to his beloved homeland of Hyrule. But it won't be as easy as chartering a boat. The island's inhabitants have no knowledge of the outside world. One creature, a talking Owl, may know the solution to Link's dilemma, but first Link must tackle eight dungeons full of treacherous monsters and tricky traps. His goal: find the eight Instruments of the Sirens and awaken the omnipotent Wind Fish which rules the island. 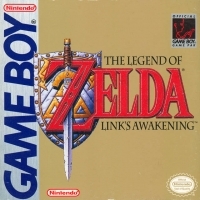 Link will battle new enemies and make new friends in one of the most in-depth fantasy adventures for Game Boy yet! A battery-backed memory will save up to three games so you never have to start your journey empty-handed. This is a list of VGCollect users who have Legend of Zelda, The: Link's Awakening in their Collection. This is a list of VGCollect users who have Legend of Zelda, The: Link's Awakening in their Sell List. This is a list of VGCollect users who have Legend of Zelda, The: Link's Awakening in their Wish List.